Child care centre Los Feliz Day Care forbids immunised children, has daily yoga, a class opossum, deep and meaningful toddler discussions, tons of flaxseed and soy milk, and kids with some very 21st-century names. The uber-politically correct centre even has its own Twitter account – except the whole thing is one completely hilarious joke. The centre has been brought to life by LA comedy writer Jason Shapiro, who started the @LosFelizDayCare account armed with inspiration from his education PhD student girlfriend and conversations among his colleagues about their children. “I would hear these ridiculous stories about the mandates at their daycare and the newsletters, and I thought this was was ripe for some comedy,” Shapiro tells CBS. He tells Time he wants the prank to be funny, but he also hopes it will lead to a meeting with his comedic hero, Two and a Half Men actor Jon Cryer, and President Barack Obama. 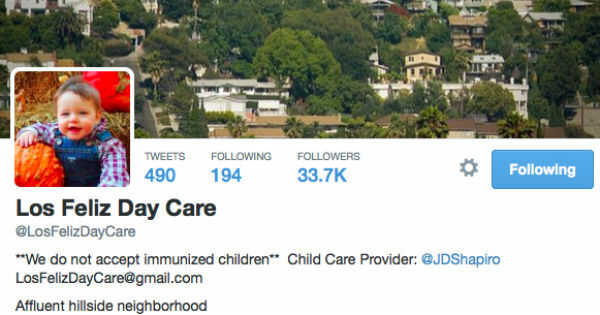 Though Los Feliz Day Care’s Twitter bio states “we do not accept immunised children”, Shapiro says anti-vaccination lobbyists are his main bugbear. But they are not the only targets of his mockery – check out some of the gems below. We're running dangerously low on flax seed. If you feel your child is likely to lash out physically or emotionally, please pick them up now. Wren and Opi spread the rumor that something "bad" will happen if David touches our yogurt maker. His strange name often makes him a target. During morning Pilates, Fivel felt that his tights were too emotionally and physically restrictive so he sat down and wrote a feelings poem. re: dollys/blankys/figures – we want to avoid gender associations, so let's refer to any and all as "love things." #Love has no #gender. For the last time: Almond milk is labeled "A." Rice milk is labeled "R." Soy milk is labeled "S." Animal milk will get your child expelled. With all the talk of October 31st Dress Up Holiday, don't forget that Multicultural Family and Friend Feast is right around the corner. We're in the midst of a divisive conversation sparked by Buzzfeed's "If Disney Princesses Had Realistic Waistlines" article. Tears of rage! Remember, we NEVER say "good job." That kind of praise is non specific and confusing. Say something like "good monologue" or "good dance." Obviously dads are welcome to participate in our Iron Mom event this weekend too. Dads can be women and moms don't even have to be women. We don't always like to say "Teacher." We're emotional/spiritual/ethical guides as your children explore the cosmos of independent learning. Emergency meeting: it's come to our attention that Tellulah has a credit card and the toddlers have been sharing it for in-app purchases. 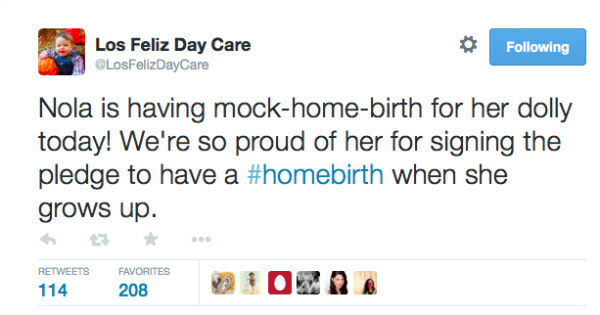 To address the recent gossip – we've heard the rumor that Apricot's mom had an epidural during her birth and we're looking into it. "Hormones in the water supply" is no longer an excuse for behavioral issues. Teacher Pat sells raw, living water and we all get a discount. New parents: please do not dress your children in the color red. We feel that its energy is too violent for our community. Parents! Superhero costumes are still not allowed. We're teaching them to be heroic through social action not the use of space weapons.